As Americans head to the polls this November, their values and basic beliefs are more polarized along partisan lines than at any point in the past 25 years. Unlike in 1987, when this series of surveys began, the values gap between Republicans and Democrats is now greater than gender, age, race or class divides. Overall, there has been much more stability than change across the 48 political values measures that the Pew Research Center has tracked since 1987. But the average partisan gap has nearly doubled over this 25-year period – from 10 percentage points in 1987 to 18 percentage points in the new study. Nearly all of the increases have occurred during the presidencies of George W. Bush and Barack Obama. During this period, both parties’ bases have often been critical of their parties for not standing up for their traditional positions. Currently, 71% of Republicans and 58% of Democrats say their parties have not done a good job in this regard. With regard to the broad spectrum of values, basic demographic divisions – along lines such as gender, race, ethnicity, religion and class – are no wider than they have ever been. Men and women, whites, blacks and Hispanics, the highly religious and the less religious, and those with more and less education differ in many respects. However, these differences have not grown in recent years, and for the most part pale in comparison to the overwhelming partisan divide we see today. In recent years, both parties have become smaller and more ideologically homogeneous. Republicans are dominated by self-described conservatives, while a smaller but growing number of Democrats call themselves liberals. Among Republicans, conservatives continue to outnumber moderates by about two-to-one. And there are now as many liberal Democrats as moderate Democrats. But the growing partisan divide over political values is not simply the result of the declining number who identify with the party labels. While many Americans have given up their party identification over the past 25 years and now call themselves independents, the polarization extends also to independents, most of whom lean toward a political party. Even when the definition of the party bases is extended to include these leaning independents, the values gap has about doubled between 1987 and 2012. Looking ahead to the 2012 election, the largest divides between committed supporters of Barack Obama and Mitt Romney are over the scope and role of government in the economic realm. Swing voters, who make up about a quarter of all registered voters, are cross-pressured. Their attitudes on the social safety net and immigration are somewhat closer to those of Romney supporters, while they tilt closer to Obama supporters in opinions about labor unions and some social issues. In contrast to the widening partisan gap, the new survey finds neither growing class differences in fundamental political values, nor increasing class resentment. As in the past, a substantial majority of Americans agree that “the rich just get richer while the poor get poorer.” Yet there are no indications of increasing hostility toward the rich and successful. And there are no signs that lower-income people have become more cynical about an individual’s power to control their destiny or the value of hard work. At the same time, the proportion of Americans who see a widening gap in living standards between the poor and middle class has grown since the mid-1980s. 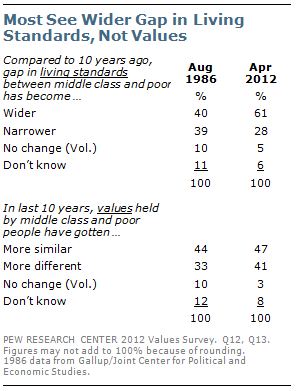 But the public sees no greater gap in values differences between the middle class and poor over this period. The polling finds little support for the broad notion of American “declinism.” As has been the case in previous political values surveys, a large majority agrees that “as Americans we can always find a way to solve our problems and get what we want.” The public’s confidence in the nation has not been dulled, even as Americans have become more skeptical about prospects for economic growth. These are among the principal findings of the latest Pew Research Center American Values survey, conducted April 4-15, 2012, among 3,008 adults nationwide. The values project, which began in 1987 and has been updated 14 times since then, tracks a wide range of the public’s fundamental beliefs. These questions do not measure opinions about specific policy or political questions, but rather the underlying values that ultimately shape those opinions. To mark the 25th anniversary of the study, we have developed an interactive database of the full history of the Center’s values studies. This tool allows you to go beyond the surface to study change and stability within political and demographic subgroups. Explore the database. The survey covers the public’s attitudes on the role and performance of government, the environment, business, labor, equal opportunity, national security and several other dimensions. Republicans are most distinguished by their increasingly minimalist views about the role of government and lack of support for environmentalism. Democrats have become more socially liberal and secular. Republicans and Democrats are most similar in their level of political engagement. On some sets of issues, such as views of the social safety net, there already were sizable partisan gaps in Pew Research’s first political values study in 1987. But these differences have widened considerably. On others, such as measures of religiosity and social conservatism, there were only modest differences initially, but these divides also have grown. Over the past two decades, the public consensus in favor of tougher environmental restrictions has weakened, also primarily because of changing opinions among Republicans. For the first time in a Pew Research Center political values survey, only about half of Republicans (47%) agree that “there needs to be stricter laws and regulations to protect the environment.” This represents a decline of 17 points since 2009 and a fall of nearly 40 points, from 86%, since 1992. The partisan gap over this measure was modest two decades ago. 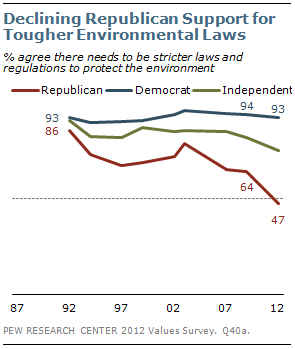 Today, roughly twice as many Democrats as Republicans say stricter environmental laws and regulations are needed (93% vs. 47%). Yet the widening partisan divide in political values is not just the result of changing opinions among Republicans. Democrats have shifted their views in a number of areas in recent years, though less dramatically: They have become more secular, more positive in their views of immigrants and more supportive of policies aimed at achieving equal opportunity. Roughly three-quarters of Democrats (77%) say they “never doubt the existence of God,” as do 76% of independents. The proportion of Democrats saying they never doubt God’s existence has fallen 11 points over the past decade. Among white Democrats, the decline has been 17 points – from 85% in 2002 to 68% currently. 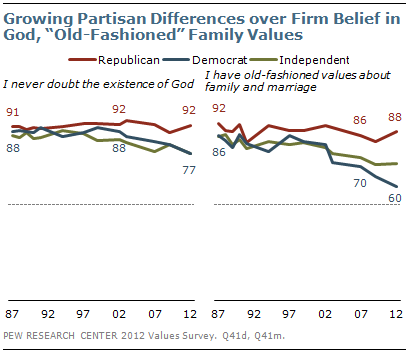 Independents also are less likely to express firm belief in God than in the past. By contrast, the percentage of Republicans saying they never doubt God’s existence is as large today (92%) as it was a decade ago, or a quarter century ago. There also has been a substantial decline in the share of Democrats saying they “have old-fashioned values about family and marriage.” Just 60% of Democrats currently agree, down from 70% in 2007 and 86% in the first political values survey. Republicans’ views have shown far less change: Currently, 88% say they have old-fashioned values about marriage and family. 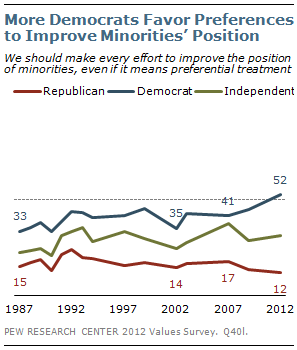 Democratic support for doing whatever is necessary to improve the position of minorities, including the possible use of preferences, has increased in recent years. About half (52%) of Democrats agree that “We should make every effort to improve the position of blacks and other minorities, even if it means giving them preferential treatment” – an 11-point increase since 2007. Republicans’ views have changed little over this period. Just 12% currently agree that all efforts should be taken, including the use of preferential treatment, to improve the position of minorities. Since 1987, the gap between the two parties has about doubled – from 18 points to 40 points. While the partisan gaps in political values have increased substantially, class divisions have not. This does not mean there are not significant differences, particularly when it comes to views about whether hard work leads to success and whether success is within an individual’s control. But these differences are generally no wider today than in recent years, or than they were in the initial political values survey. For the past 25 years, majorities across most groups have rejected the idea that “hard work offers little guarantee of success.” In the current survey, just 35% agree with this statement while 63% disagree. As in the past, those with less education and lower incomes are more likely than those with more education and higher incomes to say that hard work does not ensure success. 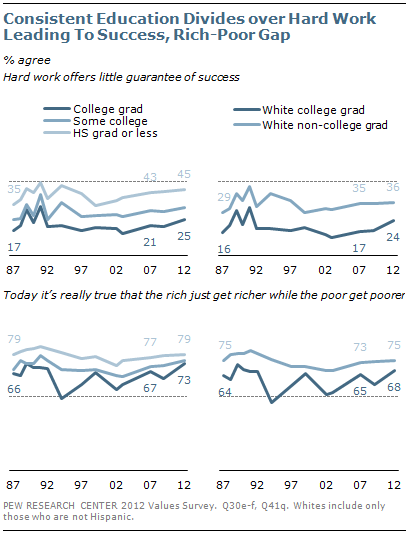 Currently, 45% of those with no more than a high school education agree that hard work offers little guarantee of success, compared with 25% of college graduates. 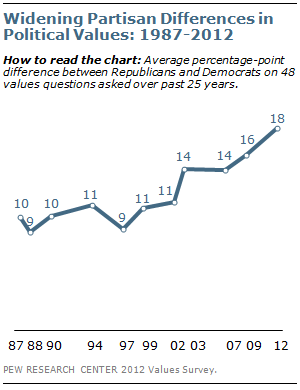 The gap was about as large in Pew Research’s first political values study (35% vs.17%). Among whites who have not completed college, 36% are skeptical that hard work guarantees success; fewer white college graduates agree (24%). The education gap among whites was comparable in 1987 (29% non-college grad, 16% college grad). There is greater agreement across socioeconomic lines in views of the gap between the rich and poor in this country. As has been the case in most values surveys, majorities in all educational and income groups agree that “today it’s really true that the rich just get richer while the poor get poorer.” In the current survey, 76% of the public agrees with this statement, about the same as the 74% that agreed in 1987. Still, there is evidence that the public sees greater economic inequality today than it did in the 1980s. About six-in-ten (61%) say the gap in living standards between middle class and poor people has widened over the past 10 years, while just 28% say it has narrowed. In a 1986 survey by Gallup and the Joint Center for Political and Economic Studies, just 40% said the gap in the standard of living between the middle class and poor had grown, while about as many (39%) said it had narrowed. Yet there has been far less change in opinions about whether the values of middle class and poor people are growing apart. In the current survey, 47% say the values of the middle class and poor have gotten more similar over the past 10 years; somewhat fewer (41%) say they have gotten more different. That is little changed from the 1986 survey, when 44% said the values of each had gotten more similar and 33% more different. The survey also finds new evidence of the toll taken by the economic downturn, both on people’s personal financial assessments and their views of the country’s economic prospects. Just 53% say they are “pretty well satisfied with the way things are going for me financially.” That matches the lowest percentage ever, reached three years ago. People with family incomes of $75,000 or more express greater satisfaction with their finances than in 2009; financial satisfaction has continued to sag among those with incomes of less than $40,000. Only about half of Americans (51%) agree with this statement: “I don’t believe that there are any real limits to growth in this country today”; 45% disagree. That is the lowest percentage ever agreeing with this statement, down slightly from 54% in 2009. 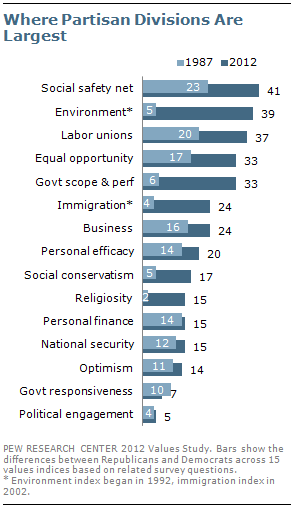 In the first political values survey, 67% said there were no limits to growth in the United States. Despite persistent economic pessimism, however, the public remains bullish about the ability of the American people to overcome challenges. 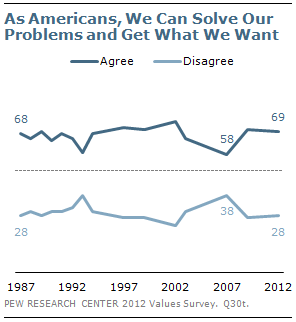 Nearly seven-in-ten (69%) agree that “As Americans, we can always find a way to solve our problems and get what we want.” While that is largely unchanged from 2009 (70%), it is up 11 points since 2007 (58%). It also is about the same percentage that agreed with this statement in the first values survey (68%). 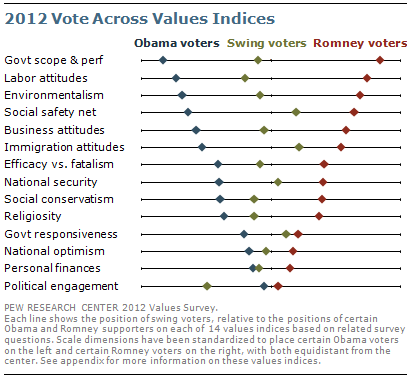 When the values items are combined into indices (grouping measures on common subjects, such as the social safety net, into a single scale), swing voters – who make up 23% of all registered voters – tend to fall about halfway between certain Obama voters and certain Romney voters. Swing voters are either undecided, only lean toward a candidate, or favor a candidate but say there is still a chance they will change their minds. (For more, see “With Voters Focused on Economy, Obama Lead Narrows,” April 17, 2012). On views about the scope and performance of government, for example, there is a wide divide between certain Obama and Romney supporters. But the attitudes of swing voters are about equidistant from backers of either candidate. The same is true on several other key indices, including views of business, the environment and national security. Nonetheless, there are some issues on which the views of swing voters tilt slightly toward the backers of either candidate. On attitudes toward labor and social conservatism, opinion among swing voters comes somewhat closer to that of Obama voters. By contrast, on indices measuring attitudes on the social safety net and immigration, swing voters’ opinions tilt toward those of Romney supporters. While the views of swing voters generally fall between those of certain Obama and Romney backers, there are a handful of individual questions that show agreement between swing voters and the supporters of one candidate or the other. For example, on the power of labor unions and admiration of wealthy people, the opinions of swing voters are closer to those of Obama supporters. About half of swing voters (51%) agree that labor unions have too much power, placing them closer to the views of Obama supporters (39% agree) than Romney supporters (82%). Just 22% of swing voters, and an identical percentage of Obama supporters, say they “admire people who are rich.” A much higher percentage of Romney supporters (38%) agree. But swing voters are far closer to Romney voters on the question of whether the government should help more needy people even if it means going further into debt: just 19% of Romney voters and 27% of swing voters agree, compared with a 62% majority of Obama voters. While Republicans and Democrats have been moving further apart in their beliefs, both groups have also been shrinking. Pew Research Center polling conducted so far in 2012 has found fewer Americans affiliating with one of the major parties than at any point in the past 25 years. And looking at data from Gallup going back to 1939, it is safe to say that there are more political independents in 2012 than at any point in the last 75 years. Currently, 38% of Americans identify as independents, while 32% affiliate with the Democratic Party and 24% affiliate with the GOP. 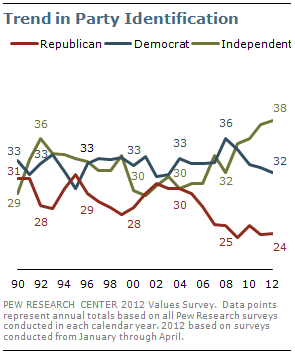 That is little changed from recent years, but long-term trends show that both parties have lost support. The percentage of Americans identifying as Democrats increased from 31% in 2002, following the 9/11 terrorist attacks, to 36% in 2008. But over the past four years, Democratic affiliation has fallen to 32%. Republican identification stood at 30% in 2002, but fell to 25% in 2008 and has not recovered since then. Over the past decade, the Republican Party has come to be dominated by conservatives, while liberals make up an increasing share of Democrats. In surveys conducted this year, 68% of Republicans describe themselves as politically conservative. That is little changed from 2008, but is higher than in 2004 (63%) or 2000 (60%). Demographically, Republicans remain overwhelmingly white and their average age now approaches 50. 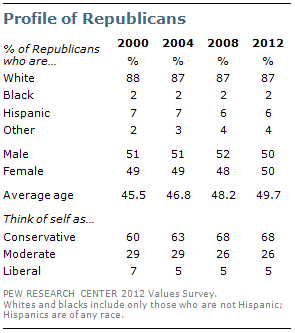 Fully 87% of Republicans are non-Hispanic whites, a figure which has changed little since 2000. Meanwhile, the percentage of Democrats who say their political views are liberal has risen from 28% in 2000 to 34% in 2008 and 38% in 2012 surveys by the Pew Research Center. For the first time, there are as many liberal Democrats as moderate Democrats. 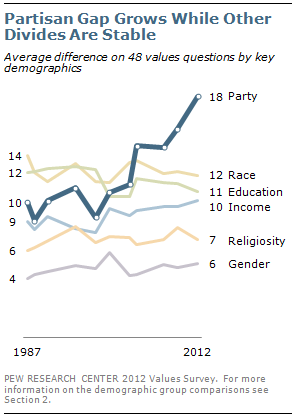 In contrast to Republicans, Democrats have grown increasingly diverse. 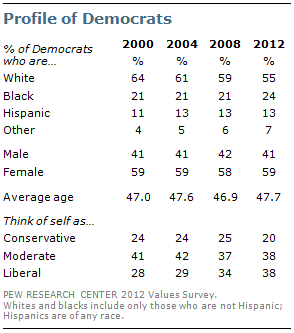 A narrow majority of Democrats (55%) are non-Hispanic whites, down from 64% in 2000. As in recent years, most Democrats are women (59%). And while the average age of self-described Democrats has risen since 2008 – from 46.9 to 47.7 – Democrats continue to be younger than Republicans on average (47.7 vs. 49.7). Independents also have become more diverse since 2000: Two-thirds of independents (67%) are non-Hispanic whites, down 12 points from 2000. The proportion of independents who are Hispanic has nearly doubled – from 9% to 16% – over this period. 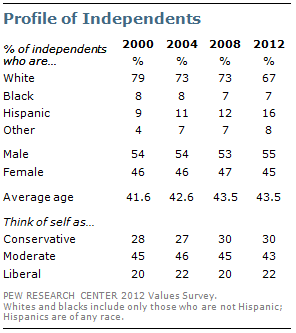 A plurality of independents (43%) describes their views as moderate, while 30% are conservative and 22% are liberal. These views are largely unchanged from previous election years.